With almost 80 million passengers in 2017, Heathrow airport in London is one of the world’s busiest in traffic. Thousands of travellers use this huge airport every day to fly away, arrive on destination or take a connecting flight, making it more and more necessary to have hotels in its own premises. Heathrow currently houses two hotels only, in Terminals 4 and 5, located opposite the runways and far from the heart of Heathrow, the Central Terminal Area with Terminals 2 and 3. Starting in May 2017, the Arora Group is building a new 14-storey hotel next to Terminal 2, also known as The Queen’s Terminal. An essential part of the works is being held by a 21LC750 tower crane, supplied by rental company City Lifting, dealer of Linden Comansa in the UK. 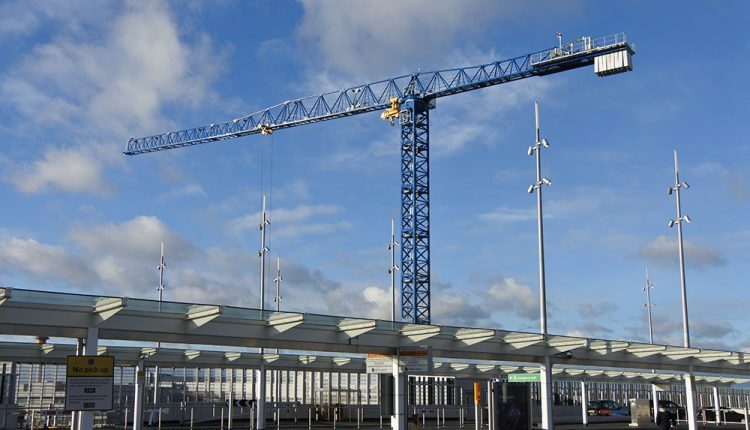 To lift the heavy prefab modules of up to 13,200 kilos, City Lifting installed in Heathrow a special model of the 21LC750 crane, with maximum load capacity of 50 tonnes instead of the regular 48 tonnes. This increase in the load has been possible thanks to a new and lighter trolley / hook set and the use of compact wire rope, which improves not only the maximum capacity but the entire load diagram. This design has been applied on this 21LC750 after a brand new model of large tower crane that Linden Comansa will launch very soon. The 21LC750 in Heathrow was erected with a freestanding height of 51.3 metres and jib length of 55 metres. With such configuration, de jib-end load of this special model is 16,200 kilos, being able to lift up to 17,280 kilos when using the PowerLift system, which comes as standard in all Linden Comansa flat-top cranes. According to Trevor Jepson, owner of City Lifting, “the 21LC750 at Heathrow Airport is the largest flat-top crane in the United Kingdom. We are convinced that when the crane finishes its job in this project, we will receive plenty of rental enquiries, because the trend in construction is to use heavier prefabricated units and machines like the 21LC750 will be more necessary for construction companies to work in a quick and efficient way. This model is the perfect addition to our tower crane fleet, which includes 43 units from Linden Comansa“.